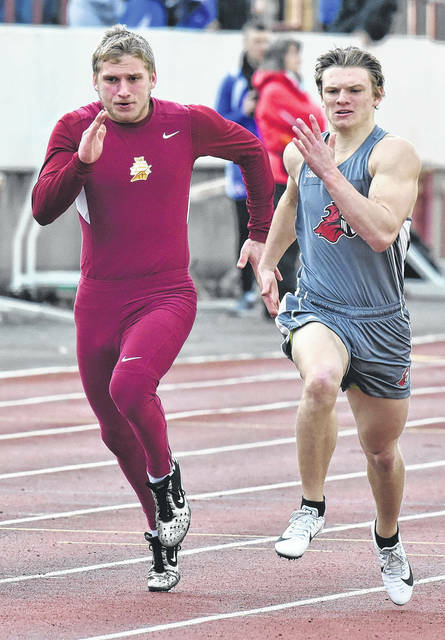 Point Pleasant junior Josh Wamsley, right, hits full stride during the 100m dash held on Friday, March 30, at the Herbert Hoover Invitational at Laidley Field in Charleston, W.Va.
ELLENBORO, W.Va. — The Point Pleasant track and field teams battled with a dozen other programs on Friday night at the 2018 Pizza House Invitational host by Ritchie County High School. The Lady Knights had seven top-six finishes and placed sixth overall with 38 points, while the Black Knights earned a dozen top-six efforts and finished ninth with 28 points. Williamstown captured the girls title with 120 points, while Doddridge County (93) and Oak Glen (86) respectively came in second and third place. The Lady Knights came away with a single event championship and a trio of top-three efforts, with Sami Saunders leading the way with a winning height of 5 feet, 6 inches in the high jump. Saunders was also the pole vault runner-up (9-0) and also placed fifth in the long jump with a distance of 15 feet, 1½ inches. The quartet of Madison Hatfield, Teagan Hay, Ashley Staats and Allison Henderson combined for a runner-up effort of 1:55.25 in the 4x200m relay. Hatfield was fourth in the 400m dash (1:05.39) and Hay was fourth in the 100m dash (13.40), while Henderson placed fifth in the 400m dash with a mark of 1:05.95. St. Marys won the boys championship with 101 points, finishing just four points ahead of runner-up Doddridge County (97). Robert C. Byrd was third overall with 71 points. The Black Knights did not earn an individual event title, but the Red and Black did secure a single second place finish from Eddie Mayes in the shot put following a throw of 43 feet, 6 inches. Luke Wilson ended up fourth in the 1600m run (4:48.26) and was also fifth in the 3200m (10:49.95) event, while Josh Wamsley finished fifth in the 100m dash with a mark of 11.89 seconds. Jesse Gleason placed fifth in the shot put (42-3) and was also sixth in the discus (124-6). Trevon Franklin was sixth as well in the shot put with a heave of 41 feet, 3 inches. Point Pleasant also earned top-six finishes in all five relay competitions, including a fifth place effort of 1:06.62 in the 110m shuttle hurdles from the foursome of Brady Adkins, Kaydean Eta, Logan Southall and Zach Rediger. Wamsley, Adkins, Cason Payne and Zac Samson were fifth in the 4x200m relay (1:38.35), while Payne, Wamsley, Samson and Nick Leport placed fifth in the 4x400m relay (3:47.87). Wamsley, Payne, Adkins and Garrett Hatten ended up sixth in the 4x100m relay with a mark of 47.08 seconds. Hatten, Leport, Samson and Peyton Hughes were also sixth in the 4x800m relay with a time of 9:38.03. Visit runwv.com for complete results of the 2018 Pizza House Invitational held at Ritchie County High School.